This is very much an entry-level ride, suitable for novice riders or for those who simply want an easy, not-too-hilly loop. It is also one of the most accessible of our recommended routes, beginning within the Santa Rosa city limits. Begin from Youth Community Park with a run north on Fulton Road. Turn left on Piner Road and head west out into the country, country in this case consisting of oak-dotted meadows and vineyards. Turn right on Olivet and almost immediately left on West Olivet, which, combined with Oakwild Road, makes a pleasant, traffic-free swing out to the edge of the sprawling meadows bordering the Laguna de Santa Rosa. We have to endure a busy mile along River Road, heading west, to get to our next quiet side road. Fortunately, this busy section has wide, smooth shoulders. We dodge off the main road on a “cloverleaf” style exit, beginning with a right and swinging through 360° around and under River and up the other side. This only resembles a freeway exit in the most superficial way, because the road we end up on—Trenton—is about as quiet and undeveloped as a road can be. Trenton climbs gently through woods, merges into Laguna Road, and then the route recrosses River—watch for fast cross traffic—and descends briefly to a run along Mark West Creek on Trenton-Healdsburg Road. After another little climb on Trenton-Healdsburg, we turn right and head downhill—mildly—on Mark West Station Road, which travels through dense woods at first and then passes the site of a prize winning dairy which has since given way to vineyards. 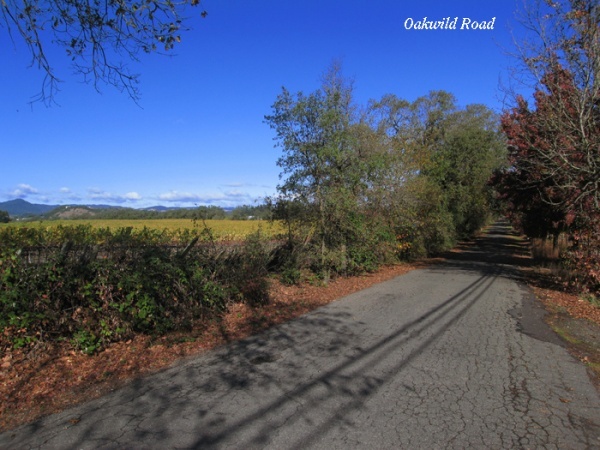 A left turn on Starr Road leads to another little climb and more quiet, rolling miles through a mix of woods, vineyards, and horse pastures, plus a liberal sprinkling of rural residential properties. Starr eventually penetrates the suburban fringe of the town of Windsor and we ride through a mile or two of relatively decent looking tract neighborhoods on our way into the town center. Windsor is an old Sonoma County town, dating from the 1870’s, when it was a busy stop on the local railway line. But in recent years it had seen most of its small-town charm subsumed in a rapid expansion of subdivisions and auto-oriented sprawl. Fortunately—for us—the city leaders put the brakes on runaway building a few years back and instead focused their energies on the construction of a new downtown core designed in the style now known as New Urbanism: friendly for walkers and cyclists. Our route visits the heart of that reinvented downtown core: Windsor Town Green, where several streets of shops and municipal offices face onto a large, attractive park. Some argue that the faux-1900 storefronts look a bit ersatz, but the overall effect is quite pleasant. You can judge for yourself the merits of the place. We are proposing a break for a coffee at Cafe Noto, which has alfresco seating facing the park. After the coffee break, we retrace our route for a couple of blocks and then head south on Windsor Road, passing through more new tracts—all relatively attractive—and out into country again, past a golf course and a rural cemetery and along the backside of the county airport. Turn left from Windsor onto Slusser and continue south. During a good portion of the year, Slusser is made more enjoyable by a long section bordering the Kunde Estates winery property. The vineyards are there, but in the foreground, along the road, Sarah Kunde developed a vast roadside flower and rock garden, splashed with the confetti colors of dozens of species of wildflowers and bulbs. Something is likely to be blooming here, almost any time of the year. Both Windsor Road and Slusser are mostly level, but both have a few modest uphill and downhill features as well...just to keep you awake. At its south end, Slusser tees into busy River Road. We turn left on River for just a few hundred yards before jogging over onto Woolsey Road, which runs parallel to River but carries a tiny fraction of the traffic the main road handles. Turn right off Woolsey onto Wood. Woolsey and Wood present a mix of meadows, vineyards, and rural residential ranchettes...more of the latter as we approach the outskirts of Santa Rosa near the far end of Wood. Woolsey is mildly rolling and Wood is virtually flat. Wood tees into Fulton Road. We turn right and head south for a little over a mile back to our start site. Fulton is a busy, straight, flat road and not a great one for cycling. But it has very wide shoulders and is used constantly by local riders, as there isn't really a better option in this particular area.